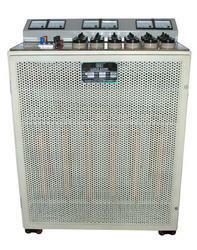 We are a leading Manufacturer of load banks from Vadodara, India. We manufacture and export high class Load Banks, which is a single phase and three phase variable Lamp or resistor or capacitor load and is housed in a metal case. It is used for stimulating load conditions to test Voltmeters, Ammeters and Watt meters, using load switches provided on the bench. The total simulated load is the sum of loads of all 'ON' switches.